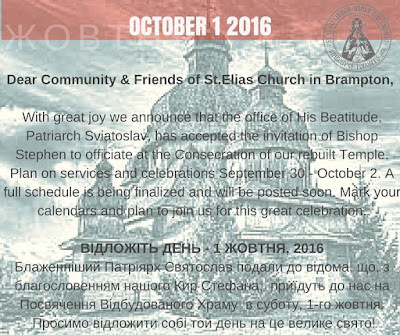 The head of the Ukrainian Greek-Catholic Church, His Beatitude Sviatoslav Shevchuk, will consecrate the finished church at the end of September and beginning of October; details will be announced on their Facebook page. If you are anywhere near the area, you should certainly attend the ceremony if at all possible. St Elias has and deserves a reputation as a place where the Byzantine liturgy is cultivated in the fullness of its richness and beauty, and this will be a unique opportunity to witness a ceremony of even-greater-than-usual magnificence.